This tiny village was once a railway junction, although you'd need a fairly vivid imagination to picture it now. 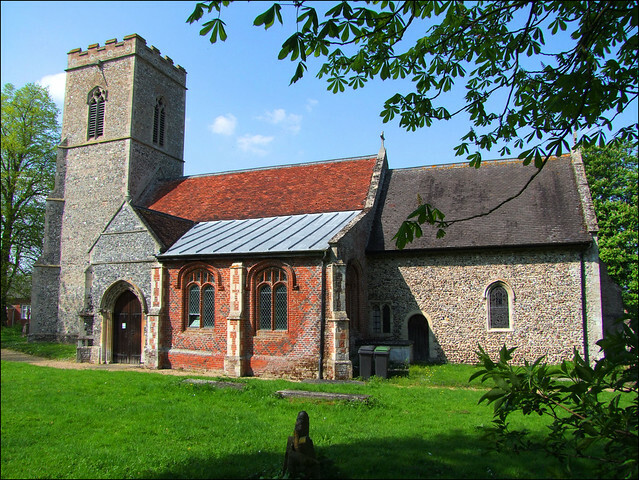 The Mid Suffolk Light Railway ran through to the north of the church, and in 1912 the company put in a spur line to Debenham, the only town anywhere near the route of the line, albeit one of Suffolk's smallest. It was an ill-conceived plan; they never obtained a passenger licence for it, and its usefulness for freight was somewhat curtailed by their inability to bring it closer to Debenham than a field a mile to the north of the town. It absorbed a huge amount of the company's capital, and was probably partly responsible for the Middy's demise in the 1950s. It is ironic that the only substantial relic of the railway is on this spur, the embankments of a bridge over the B1077. All Saints has survived much more successfully, of course. It did fall victim to the enthusiasms of Edward Hakewill in the 1870s, an architect I've never particularly warmed to, although he made a fairly decent stab at this one. This is mainly because he resisted the temptation to install a low north aisle, a particular habit of his, and not an endearing one I think. You can see the results of it at places as diverse as Shottisham and Brantham. He did, however, install the rather alarming triple lancet east wall to the chancel. The need for a new aisle here was obviated by the presence of a very fine brickbuilt south aisle and chapel, flush with the porch and with its own entrance from it. It was built as a chantry chapel for the Garneys family in 1524, and was dedicated to St John. The juxtaposition of red brick and flint is always a charming one, and moreso than usual here. On a sunny day it looks one of East Anglia's best. Within the south porch is an interesting doorway, right out at the very end of the Norman period before it tips into Early English. You step through it into a neat, clean interior, obviously very well loved and cared for. There is a good example of a 13th century arcaded Purbeck marble font set on 19th Century legs, and indeed much of what you see here dates from Hakewill's considerable restoration. A particularly interesting medieval survival is the set of consecration crosses, outlined in the cutaway 19th century plaster. Many of these survive in East Anglia because with walls made of flint rubble rather than stone it was impossible for the Victorians to rake out the old plaster as they did in many of England's churches. I was also fascinated by the slabs of lead hanging on the north wall. These date from a 1714 renovation of the roof, and are inscribed with the names of churchwardens and donors of the time. One of them carries the name Garneys, a reminder of continuity from two centuries earlier. The south aisle is now furnished in a devotional manner, albeit dedicated to the Blessed Virgin rather than to St John now. It once contained an intricate Garneys brass, contemporary with the chapel, which Cautley and Arthur Mee both saw in the 1930s. T.M. Felgate illustrates it in his Knights on Suffolk Brasses of 1976, at which time he records it as being 'loose in the vestry'. I wonder where it is now.